"CONDENSATION - ENERGY EFFICIENCIES UNWANTED COMPANION"
What Is Condensation? Condensation generally occurs when warm air rises, cools and loses its capacity to hold water vapour. Air contains water vapour in varying quantities, condensation comes from the moisture in the air:-warm air holds more moisture than cold air, condensation forms when warm moist air comes in contact with cooler air or a cooler surface, the warm air is unable to retain the same amount of moisture and the water is released to form condensation in the air or on the surface. Moisture in the roof cavity can contribute to allergy problems: asthma, fungal infections, sick building syndrome due to growth of bacteria, mildew, mould ie: mould fungus growing in poorly ventilated spaces travel through the air in tiny spoors triggering allergic responses. Houses have become more effectively sealed from the outdoor elements sealing any moisture produced within the home, providing excellent conditions for condensation to occur. Moisture can come from numerous sources from within the home, large quantities of water vapour are produced by the following daily activities: cooking, showers, washing, breathing and heating these activities can condense to form 11 litres of moisture a day. Health problems linked with high levels of airborne mould spores:Allergic reactions to moisture, dampness and mould problems for allergy sufferers are the allergen revealing conditions such as problems with the respiratory tract, allergic bronchopulmonary aspergillosis, asthma, fungal infections and irritants: Irritation of the eyes, nose and throat.Very damp moist areas such as the humid air in the roof cavity caused by moisture laden insulation and in general a moisture laden roof cavity initially sourced by the problems of condensation is the perfect area for a mould supporting environment, for mould spores in abnormally high quantities these present a health hazard causing fungal infection and producing mycotoxins. Some mycotoxins can be harmful or lethal when the exposure is high enough.The hazards of mould and mildew have been related to Sick Building Syndrome (SBS). Open and closable ceiling vents should be ducted via flexible ducting from the ceiling vent through the roof cavity to the outside atmosphere, as these ceiling vents allow dust and insulation fibres to enter the home, triggering allergic reactions. Roof condensation occurs when moisture becomes trapped between the roof and the ceiling insulation, this problem can be caused by insufficient ventilation or no ventilation to the roof cavity. IS IT RAINING IN YOUR ROOF? Condensation roof leaks occur when condensation accumulates to a point that it rains down onto the ceiling below, these are fairly common (and can often be mistaken for a leak due to rainfall) sometimes condensation leaks are found by a stain in the corner of a room or around a light fitting, you may discover that there are several stains. Multiple rings in a condensation leak stain indicate that the leak has been there for sometime quite often the leaking is not noticeable for a while as the ceiling insulation is soaking the moisture up until it becomes very obvious. There are many types of roof cavity vents available today: ridge vents, turbine vents, eaves vents, roof fans, solar fans, gable vents, louvers, static vents. These all come in a wide variety of sizes, shapes and styles. To properly ventilate a roof cavity you need intake vents to allow fresh air into the roof cavity and exhaust vents to allow air to leave the roof cavity, the combination of an intake vent in conjunction with an exhaust vent uses the natural forces of wind pressure and the thermal effect:- heat transfer – convection, Newtons Law of Cooling, therefore it is essential to have a balanced roof ventilation system. Do not have the ability to intake air. Turbine vents are unattractive, have moving parts that wear out and become very noisy. Will blow out in very high winds leaving a hole in the roof allowing rain water to enter the roof cavity. Independent testing has shown that this type of roof ventilator does not work to ventilate a roof cavity, the testing found “The manufacturers belief is that the wind turbine will expel air however a wind turbine does not move air, but instead is moved by air. This is a fundamental fact not understood by the manufacturers of these products”. Value for roof cavity ventilation – Nil. Under eaves vents that fix flat against the eaves will allow air to rise due to thermal effect although will not work as an intake ventilator to allow enough air to enter the roof cavity to ventilate the roof. 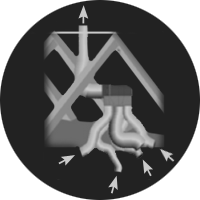 Flat eaves vents can block up with dust and spider webs (as shown in illustration) furthermore the insulation in the roof cavity will generally block any air from the eaves entering the roof cavity. Value for roof flow ventilation - not good. Do little for circulation of ventilation through a roof cavity, they are more for a decorative aesthetic appearance for a home and depending on where they are placed in the gable could possibly contribute to condensation in the roof cavity. Value to roof cavity ventilation will allow air to enter a roof cavity doing little to achieve any advantage to exhaust air from a roof cavity – very low. Much the same as gable vents especially when considering condensation problems. Do not have the ability to intake air. Roof fans use power , having moving parts and eventually will wear out, they need to be used in conjunction with ceiling vents or eaves vents, static ceiling vents open to the roof cavity will allow insulation fibres and dust to enter the home (the enclosed space) these dusts and fibres could trigger allergic responses. Eaves vents could be blocked to the roof cavity by insulation. Although some of these fans could be manufactured from corrosion resistant steel most of them are manufactured in plastic. Value for roof ventilation - very low. The same as for roof fans apply to solar fans with a slight difference solar fans will not work without sunlight so when the sun goes down no solar fan and zero use for winter condensation problems. Value for roof ventilation - very low. Do not have the ability to intake air, are generally quite obvious, can blow out in high winds and usually make a home look like a factory. For them to be of any use they would need to intake air from the likes of some type of eaves vent. See Eaves Vents. Value for ventilation of the roof cavity - not good. Can generally be open and closed. These vents allow dust and insulation fibres to enter the home, (the enclosed space) and can trigger allergic reactions, these types of ceiling vents should not be used. Any ceiling vent, bathroom fans etc should be ducted from the ceiling vent through the roof cavity to the outside atmosphere. Do almost nothing to ventilate a roof cavity as there is no method for air intake. Value for roof cavity ventilation – Nil. Notwithstanding some of these products could be manufactured in non combustible metals, these products are generally manufactured using combustible materials such as plastics, aluminium or wood leaving them vulnerable to fire. Some of these products if manufactured from non combustible metals are not protected from ember attack leaving them vulnerable to bushfire attack. Some that have an ember attack screen within them, have the ability to fill with embers this is inside your roof, need I say more. One of the best systems for removal of condensation problems and ventilation in the roof cavity on the market today is the tile ventilator system. 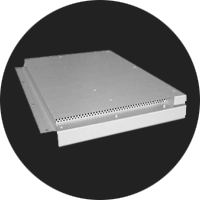 The tile ventilator system incorporates the combination of an intake ventilator in conjunction with an exhaust ventilator using the natural forces of wind pressure and the thermal effect, these are a very cost effective product that will have the roof cavity breathing healthy for all seasons. Will hold fast in high wind areas. 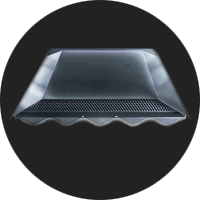 For condensation and ventilation in corrugated metal roofs the same company that manufactures the tile ventilator have a product the Smoothline Ventilator which incorporates the use of an intake ventilator and an exhaust ventilator working on the natural forces of wind pressure and the thermal effect. This is the best product on the market today for ventilation of corrugated metal roofs. Very cost effective, will have the roof cavity breathing healthy all seasons. These systems are good for the ventilation of the enclosed space (inside the home) although costs can run into many thousands of dollars they do little for the condensation problems in the roof cavity. What roofs are susceptible to condensation? All types of roof coverings are vulnerable to condensation problems; concrete and terra cotta tiled roofs, sarked or not sarked - and all metal roofs. How would I know if I had a roof condensation problem? Usually you can see the evidence of condensation on the ceiling by obvious stains either in the corners of a room, around a light fitting or sometimes running down the walls. What if I can't see any damage on the ceiling or the walls? Generally condensation is the silent enemy within, and you can't see anything until it's too late. You could have a reputable roofer or a mould and mildew expert inspect your roof cavity. I can guarantee if you have a metal roof without roof cavity ventilation, you definitely have a condensation problem. When faced with a problem with condensation in a roof cavity, what do you suggest as a solution? I would suggest a roof ventilation system that incorporates an intake vent to allow fresh air into the roof cavity, and with an exhaust vent to allow air to leave the roof cavity. Such a system would remove the condensation problems from the roof cavity.